William Castle’s mystery programmer Crime Doctor’s Man Hunt is yet another wacky outing with Warner Baxter as Robert Ordway, M.D., Ph.D. (a.k.a. the Crime Doctor). The Crime Doctor was a character created by Max Marcin for a Sunday-night mystery radio show that ran from 1940 to 1947 on CBS stations. Like a lot of radio detectives (e.g., Boston Blackie, the Falcon), the Crime Doctor also got his own series of hour-long B movies. In the first film in the series, Michael Gordon’s Crime Doctor (1943), a Depression-era crook and racketeer named Phil Morgan survives a murder attempt, but suffers from complete amnesia, reinvents himself as “Robert Ordway,” and puts himself through medical school. Once he gets his degree, he focuses on rehabilitating criminals. His past eventually catches up with him, but everything works out all right, and he is able to continue being Dr. Ordway, putting crooks behind bars and helping the helpless. Crime Doctor is one of the best films in the series. The subsequent films are all a lot of fun, but Dr. Ordway’s checkered past is rarely referred to. 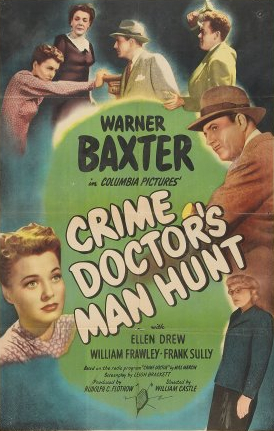 Baxter’s performance in the lead role is always top-notch, however, and most of the Crime Doctor pictures are a cut above most other mystery programmers from the ’40s. In Crime Doctor’s Man Hunt, John Foster (Myron Healey), a young, pencil-mustachioed man suffering from “bomb shock and combat fatigue,” comes to see Dr. Ordway. He’s suffering from fugue states in which he wanders in a daze, always drawn to the same intersection, but he doesn’t know why, and never remembers how he got there. He could get treatment from the Army, but he doesn’t want his fiancée to know about his condition. His fiancée, Irene Cotter (Ellen Drew), comes to see Dr. Ordway right afterward. (Foster’s attempts to conceal his condition from her were clearly in vain.) Dr. Ordway deflects her questions and tells her that he can’t violate any patient’s confidentiality. As with most of the Crime Doctor films, things get loonier as the film goes on. We learn that Foster had his fortune cast during a “slumming party” downtown, and was told by a fortuneteller named “Alfredi” (real name “Alfred Hemstead,” played by Ivan Triesault) that he would meet his violent death on the corner of Garth and Davis streets, which is why he is continually drawn there. There’s also a case of split personality, which I won’t say too much about in order not to give anything away. However, even the dimmer bulbs in the audience will see the “twist” ending coming from a mile away. I’m not even sure it was meant to be a surprise. 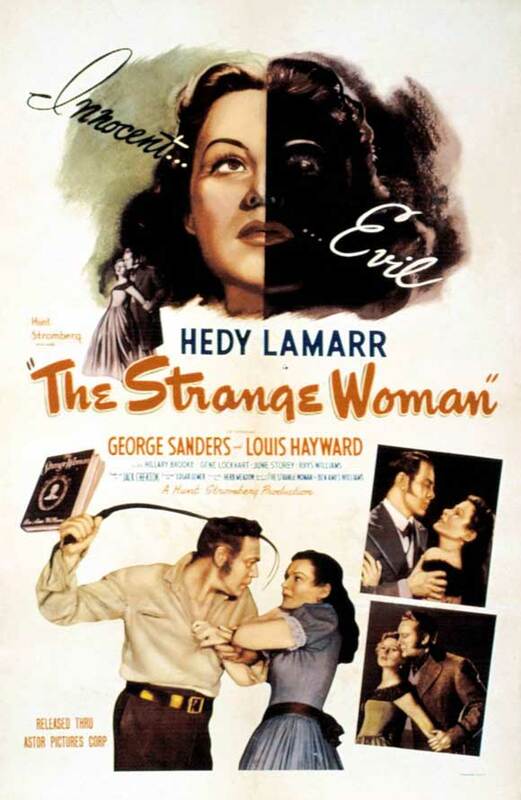 Ordway comments at the end of the film that this has been a strange case, first the fugue, then the split personality. “Doctor, I’d like you to come see my wife,” says Police Inspector Harry B. Manning (William Frawley). “Split personality?” asks the doctor. “No personality,” quips the inspector. 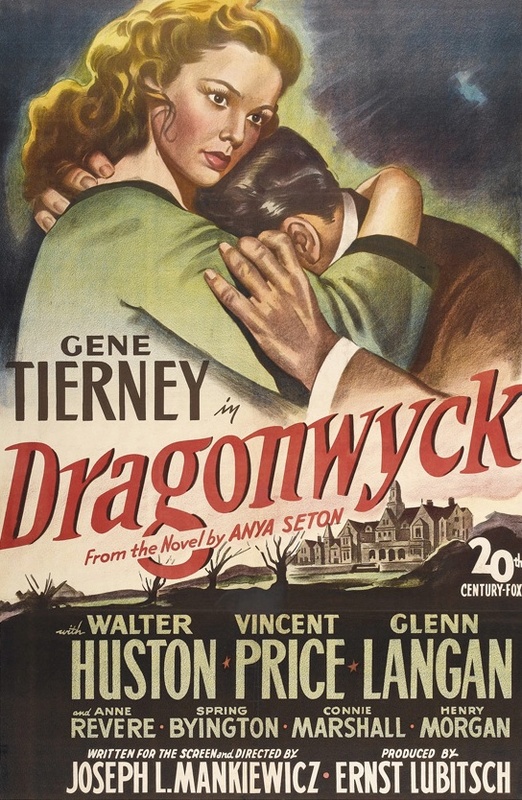 Posted in 1946, October 1946 and tagged Bernard Nedell, Claire Carleton, Columbia Pictures, Crime Doctor's Man Hunt, Cy Malis, Dwight Caldwell, Ellen Drew, Eric Taylor, Francis Pierlot, Frank Sully, Harry Morgan, Ivan Triesault, Jack Lee, Larry Darmour Productions, Leigh Brackett, Leonardo Scavino, Mary Newton, Max Marcin, Myron Healey, Mystery, Olin Howland, Paul E. Burns, Paul Sawtell, Philip Tannura, Ralph Linn, Rudolph C. Flothow, The Crime Doctor, Wanda Perry, Warner Baxter, William Castle, William Frawley. Bookmark the permalink.